Welcome to Time Out Singapore's 52 Weeks of #ExcitingSG – our commitment to showing you the best of what's going on in the city this week. Every Monday, a guest writer who's "in" with the scene shares a recommendation on what to see, eat, do or buy in the city. This week, we chat with Charlotte Goh, Executive Director of Playeum – Children's Centre for Creativity. This week marks the start of the June school holidays – so we check in with her to see what to do with the kids this month. Singapore is a young country and a cultural melting pot. Over the years, our country has been creating a robust arts scene with our museums, the theatre industry, our local music scene etc. This is an exciting time for us because there are so many areas within the creative arts that we can explore and expand on. It seems like art and culture scene in Singapore is mostly aimed at adults – but Playeum is entirely aimed at kids. How important is it to expose kids to the art scene from a young age? And what are the benefits of doing so? The art scene in Singapore seems to be in constant flux and that's great for adults. But a lot of what's aimed at kids is still very structured or run-of-the-mill – so Playeum aims to be that bridge in the community. I feel we came in at just the right time. We encourage children to explore open-ended, self-directed play and to do that, we provide the platform for children to be able to think and create freely and to explore and express their imagination. This 'be yourself' approach is what will keep the local arts scene alive. When setting up a kids-focused exhibition, what sort of elements do you try to incorporate to keep the little ones engaged? 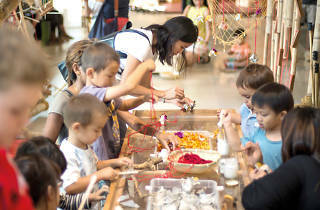 Playeum – Children’s Centre for Creativity is hands-on, interactive and constantly evolving. We work with all kinds of materials (almost everything is donated and upcycled! ), lights, colours and more. Kids can come in and just experiment with what we have. Our open-ended concept means there are no right or wrong answers – it's completely up to their imagination and thought processes. This helps them to build confidence and their ability to problem-solve. It's the June school holidays, can you suggest some ways parents can enrich their kids' time while still keeping them entertained? Getting their hands dirty and going outdoors! It's something they rarely get to do on days where they have school and homework so going out during the holiday is a must. Taking them to parks is a great way to keep them engaged – there are so much to look at, observe and learn about. One park to check out is Hindhede Park, next to Bukit Timah Nature Reserve. The trails are perfect for families and there’s even a beautiful quarry to check out! Children's season in Singapore is always filled with tons of exciting activities to check out! One of them is Playeum's newly launched hands-on exhibition Going Play-ces! Designed for children aged 1-12, the exhibition invites families to explore concepts of STEAM (Science, Technology, Engineering, Art & Mathematics) through hands-on and engaging activities in various 'landscapes'. 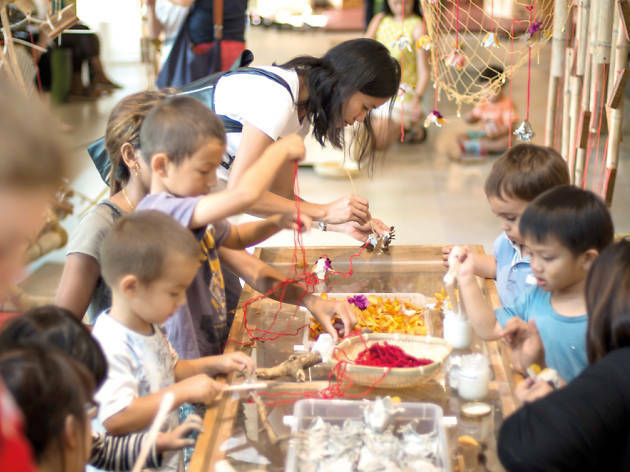 Other than that, our friends at The Artground are also organizing a 10-day festival for children called 100 and 100 more – check out their new exhibition Rolling @ TAG while you're there! And if you're looking for something outdoorsy, Admiralty Park is a great place to visit. It's the largest park in the north that has an inclusive playground and an abundance of nature surrounding it.